A non-shunga scene taking place in a Kabuki theatre. The upper section represents the more expensive seats in boxes that are located slightly higher than the central stage. In the foreground, the audience is squeezed between the boxes and the hanamichi (‘flower path’), a raised walkway joining the stage on the audience’s left and passing through the theatre. The old man seated in the right box and staring out at the viewer might be a playwright or an artist. He is flanked on his right by an onnagata*. Judging from the sparrow motif on his kimono, the onnagata is possibly an actor from the Nakamura line. 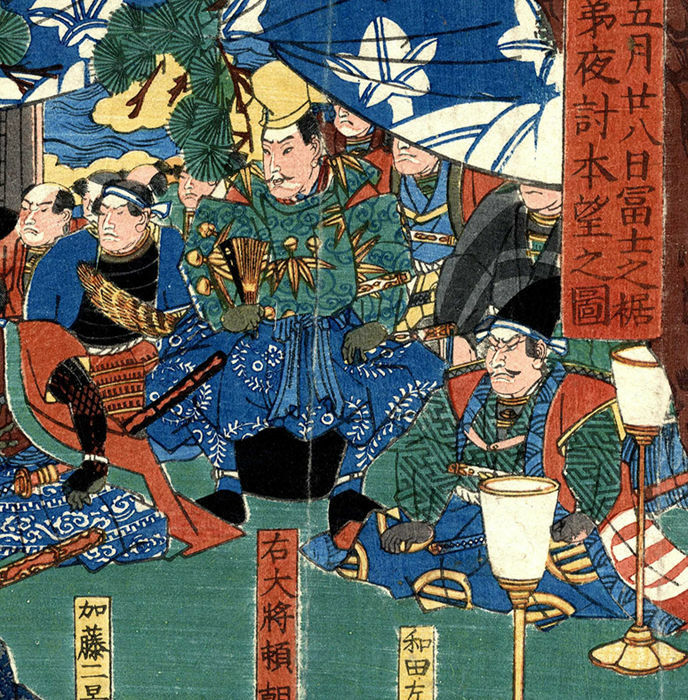 To the left in the adjacent box, the face of an actor has been cropped, but the hare pattern on his robe suggests that he is affiliated with the Arashi Hinasuke line. 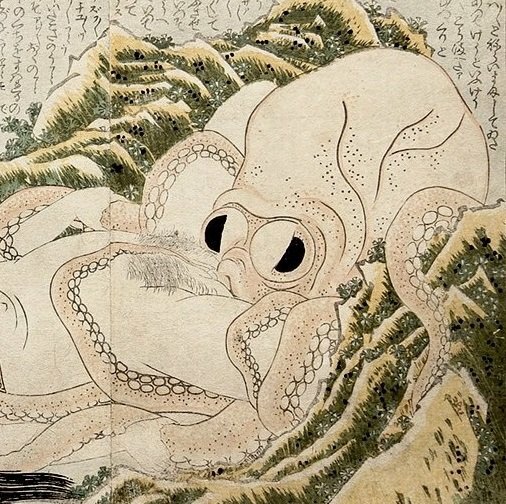 When we examine the design closer our eye gets drawn to the woman (who is observed by the onnagata) in the center of the panel who is whispering something in the ear of the “faceless” man in front of her. The latter has reached his arm through the fencing behind him and caresses her private parts. 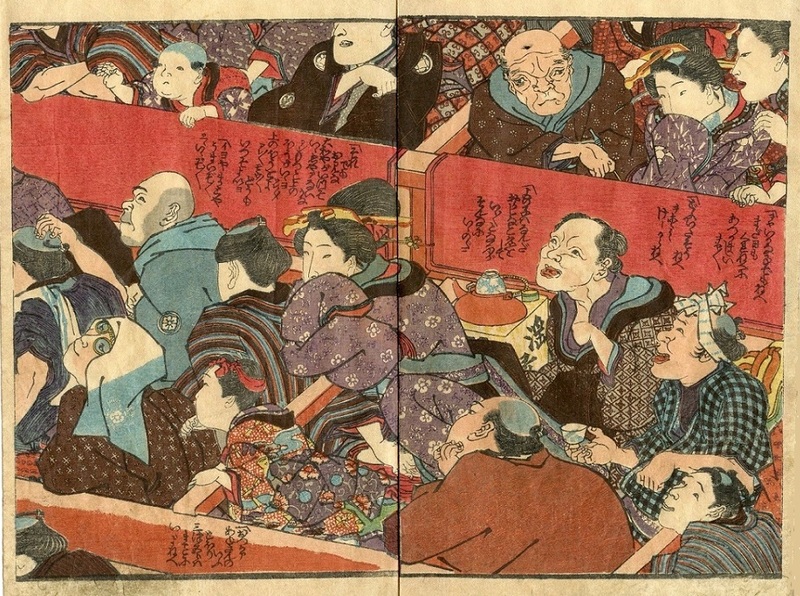 The older female sitting behind the young woman is also excited, probably by one of the kabuki actors they are watching, and is stroking one of her breasts. This series designed by Kunisada (1786-1865) is distinguished by the significant number of scenes that refer specifically to kabuki actors. This raises the question as to what degree subjects in shunga were in actual fact identifiable personalities. Would it be correct to assume that the following kabuki images were immediately identifiable to the Edo public as shunga of a particular actor who had performed a role in a recent performance, or simply as a general indication of the role itself? The title Chochidori alludes to the popular tale of the Soga brothers: the butterfly is always associated with Soga (no) Goro, the more violent of the two brothers, whereas the plover is linked to the more mild-mannered Soga (no) Juro. Click HERE for a striking gay encounter involving a wakashu kabuki actor…!! !